Amanda Holden’s translation, originally made for David Freeman’s fine staging in the Albert Hall and since revised, is absolutely first-rate. It is clear, direct, faithful and above all, musical. In contrast to some earlier versions, it unobtrusively follows the rhyme patterns of the Italian. Some of the lines – the acid test – sound as though they had been set by Puccini himself: `My modest little meal was interrupted’ and `They say I’m corrupt’ among many others. 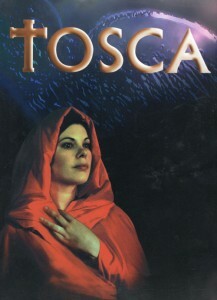 The commission to translate Tosca came from Raymond Gubbay for David Freeman’s arena production at the Royal Albert Hall; it opened on 18th February 1999 conducted by Peter Robinson and the cast included Susan Bullock and Keith Latham. The production was revived in 2008. Raymond Gubbay also mounted two concert performances to celebrate the Tosca centenary in 2000 – at the Barbican Hall (8 January) and at Birmingham Symphony Hall (14 January). AH: I revised the text with David McVicar for his production at ENO that opened on 21st November 2002 with Cheryl Barker, John Hudson and Peter Coleman-Wright; Mark Shanahan conducted and the desgner was Michael Vale; this production was revived in 2004.
you have eyes like sapphires, hers are dark as oceans! ah! 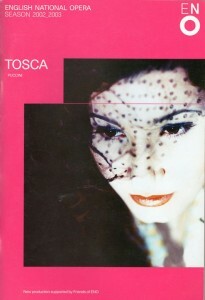 I only think of you, Tosca, of you! oh why have you abandoned me to this? ah why have you abandoned me to this?